Amazon may believe that same-day delivery can’t be done cost-effectively, but that isn’t stopping Walmart from conducting tests this holiday season in a handful of markets. Walmart said this morning that it has started offering customers in four markets the chance to buy and receive items on the same day, for $10. The inventory will be limited to “popular general merchandise items,” including toys, electronics, sporting goods and other gifts. It has launched “Walmart To Go” in Northern Virginia, Philadelphia and Minneapolis, and the San Jose-San Francisco area is coming by November. No minimum orders are required. On its July earnings call, Amazon downplayed the idea of same-day delivery, saying it could not scale economically. In contrast, eBay has been bullish on the concept, and is testing a same-day delivery service in San Francisco. There’s also a host of other start-ups entering the space, including Postmates and UPS-backed Shutl. 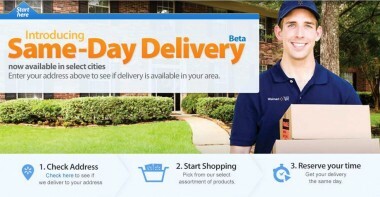 Walmart said that, in a customer survey, a majority of respondents said they would consider same-day delivery if the option was available to them. More than half said they would use this feature monthly or more frequently.